Out in the Cape Winelands there is always the possibility of golf! The 27-holes offer a splendid mix of tree-lined fairways and challenging water features all leading to superb, large greens. The Berg River that runs on the southern border of the estate and the Du Toit's kloof mountains enhance the 27-hole challenge. Boschenmeer is just 5 minutes from Palmiet Valley Estate. From a playing perspective, this 18-hole championship course designed by Gary Player, is the finest in the area and is set in a beautiful landscape. The back nine lead up to the hills with fantastic views to False Bay. Sloping positions and narrow fairways bring an exciting challenge to the game. Erinvale hosted the 1996 World Cup of Golf and currently hosts the annual SAA Open. Eighteen beautiful but different fairways between vineyards and orange plantations characterise the Spier Country Club in Stellenbosch. They are hilly and often not visible. The necessary blind strokes and many bunkers, make the game a real challenge and you can easily lose a ball. 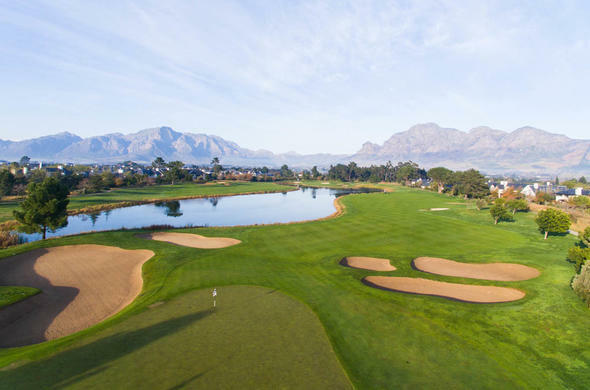 A further golfing highlight is a game on the championship course of the legendary golfer and golf course designer Jack Nicklaus: the spectacular Pearl Valley Course in Paarl. In its engineering and planning detail, the course is very rare. It is crossed by roads in only three places, and the drainage system allows play to continue just minutes after a severe cloudburst.